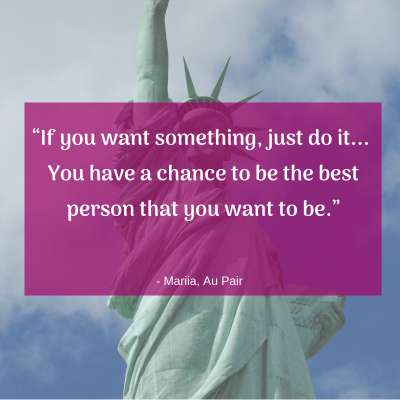 Living in America gives Au Pairs freedom and, according to the Au Pairs, changes their lives for the better. Au Pairs from all over the world say there’s a new sense of freedom living in the USA. Here, they’ve adopted a new mentality they never knew existed before: that in America, people are free to achieve their dreams. Imagine realizing, for the first time in your life, that the American Dream is possible for you, too. The Au Pair program is a unique cultural exchange experience. This J-1 visa program allows international young adults come to the U.S., where they’re able to live with an American Host Family for up to two years. Au Pairs provide childcare to the Host Family in exchange for housing, food, tuition money, a weekly stipend, and the chance to travel and experience a new culture. Not only do we hear that living in America gives Au Pairs freedom, but many Au Pairs say they adopt a new, “American” mentality. It’s hard not to look at life differently because of their time here. Like many Au Pairs, Reezah says his goals also included traveling, obtaining a driver’s license, and for his Host Family to be pleased with his work. In a few short months, he’s already accomplished each of these goals. It was important to him to be acknowledged for a job well-done, but his Host Family has gone above and beyond his expectations. But, more than these interactions with his Host Family, Reezah’s life has evolved in ways he hadn’t anticipated. This is just one example of the many ways America gives Au Pairs freedom. After spending just a few months in the U.S., Au Pairs say they feel equipped to go after their dreams. 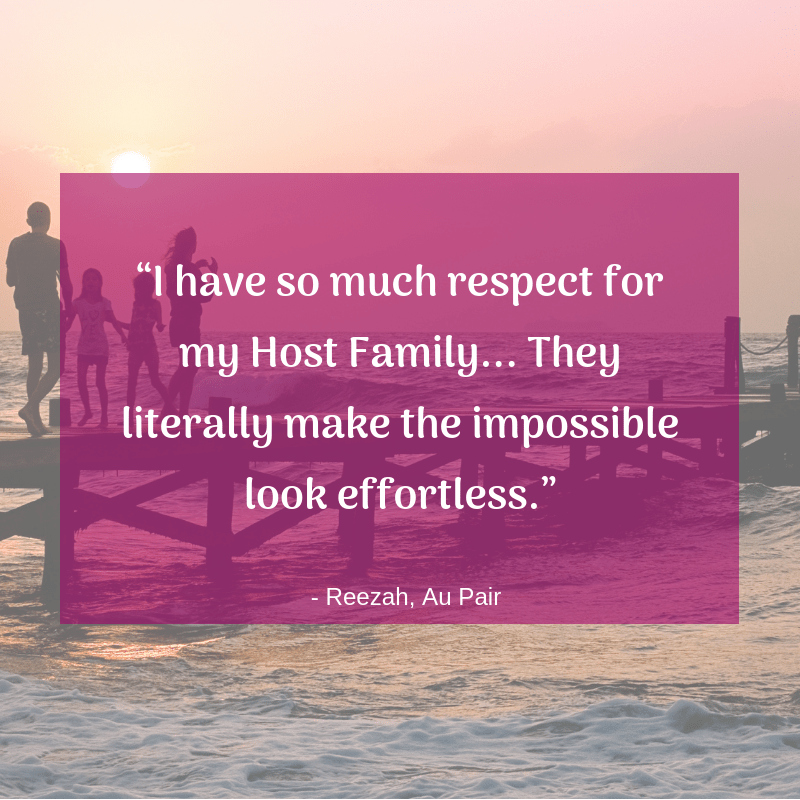 Reezah attributes a large part of his personal development to his Host Family. As he says, they gave “a small-town South African boy” a once-in-a-lifetime opportunity. But more than that, they welcomed him into their home and their hearts. Many Au Pairs credit their Host Families, and their in the program, with improved prospects for the future. 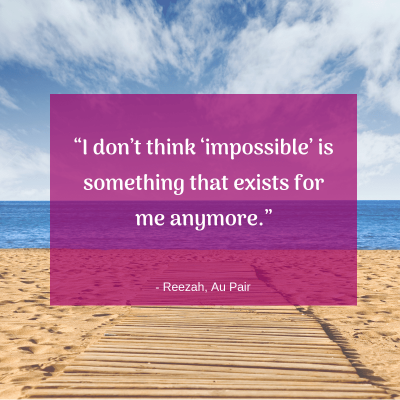 In a similar way, Mariia, from Ukraine, says the Au Pair program has changed her perspective on life. 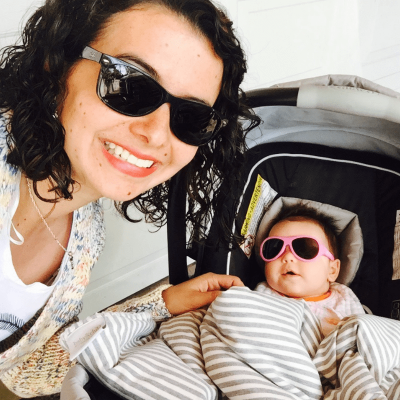 Her experience is just another example of how America gives Au Pairs freedom and a sense of how the American dream is available to anyone. She says her life has been divided into “Before U.S.” and “after U.S.” Her “two huge reasons” for becoming an Au Pair were “to travel and to work with kids,” and after fourteen months with the same family in California, she says it’s been a great chance to combine travel, study, and working with children. While in the U.S., Mariia says her Host Parents have been patient and supportive. They include her in family activities, and even asked her opinion on how to paint the interior of their home. Additionally, Mariia’s hosts have contributed to her cultural experience. For her, this included learning about local bike trails, and what Venhrin calls “cultural biking.” She has enjoyed exploring the outdoors and experiencing a healthier lifestyle with the help of her Host Parents, Natalia and Max. Participating in U.S. culture has been eye-opening to Mariia. 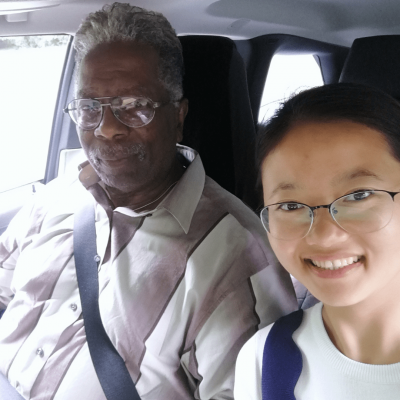 She says everything is different—people, food, roads, societal expectations, and even the American perspective on life—and that living here has given her the opportunity to gain a firsthand understanding of everything from daily habits to politics. Venhrin encourages other young adults to join the Au Pair program. 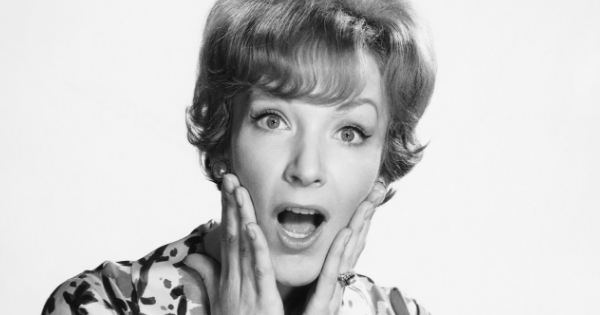 “You cannot buy it, you cannot rent it,” she says of her experience. Ingrid, from Colombia, has been in the U.S. for one year. She joined the program to develop her life skills and become adept at adulthood. 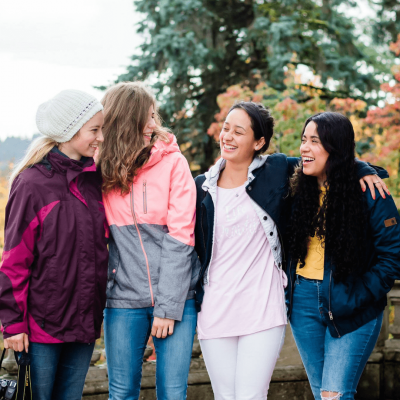 Her experience highlights how American gives Au Pairs freedom and the ability to expand their skill set in ways they typically wouldn’t at home. Ingrid loves baking, but she says that baking is different in American than it is at home. (Plus, baking isn’t the same as cooking dinner for children and yourself). “One of my goals in life was learning how to cook and survive in the attempt.” After her first attempt at baking ended in a burned cookie tragedy, Ingrid said her Host Mom, Stephanie, helped her focus on improving her cooking abilities. Stephanie was able to assist her in the kitchen and pass on what Ingrid calls “great” cooking skills. They have worked on various baking projects together, with Stephanie supervising and offering suggestions for improvement the next time around. The time spent together in the kitchen provided them the unexpected opportunity to practice Spanish together. Ingrid’s experience in the Au Pair program has taught her more than just how to cook, however. She stresses the importance of her Host Family’s support, saying that the entire family has taught her new things. This truly embodies the heart of the program, which all comes back to family and relationships. The Host Kids have contributed to Ingrid’s learning, too. Spending a year in the U.S. has changed Ingrid’s perspective, showing her how America gives Au Pairs freedom and a new sense of self. The American Dream seems to instill itself in a person’s mind after they’ve spent enough time in the U.S. Ingrid says this is the case for her, too. 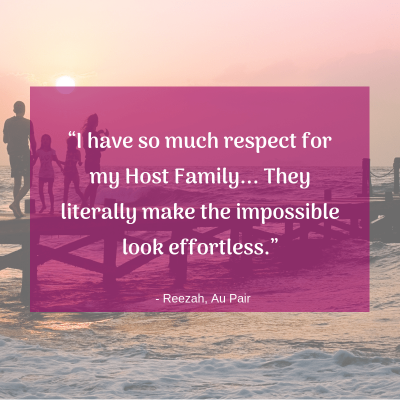 Think Hosting an Au Pair is Right For You? Click here to explore your options. Au Pair Stories: Oh, the Crazy Things Kids Do!